When searching for the best under sink water heater, the first thing you want to look for is size. 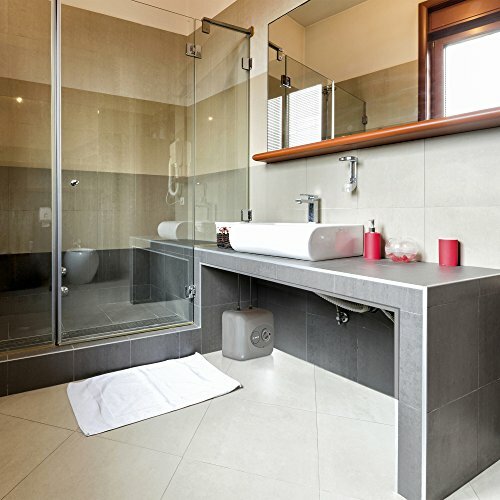 We all have limited space under our sinks and you are going to want to make sure it fits. However, some of us have more space to fill than others and can fit a water heater that has a larger capacity. Therefore, this is where you are going to have to decide what is more important, extra hot water or much-needed storage space. And, although not necessary, it is wise to find an energy-saving water heater. And, an energy-saving under sink water heater has the ability to save you on your water bill over the long run. Like Consumer Reports states, the cost of heating water consumes almost 20 percent of your household budget. Therefore, if you find an energy-saving unit, this can reduce your household budget and go towards something a lot more fun and memorable other than hot water. The next thing to look for when searching for the best under sink water heater is quality and durable materials. These materials include stainless steel and brass. And, these materials are nothing short of mandatory as they can withstand the damaging effects of water. Finally, when we went on the hunt for the best under sink water heater, we wanted our final list to have a lot of consumers backing up each water heater. Consequently, our final picks don’t disappoint. These water heaters have rave reviews from thousands of happy consumers. And, you could be next. This first pick for best under sink water heater offers you 7 gallons of water. And, to get an idea of what you can expect from a 7 gallon water heater, our friends over at Brightnest have the rundown. So, the average shower uses a gallon of water for every 2 minutes. Therefore, you can expect a 7 gallon water heater to last you about approximately 14 minutes shower time. However, there is also refill and heating time. So, if you run out of hot water, a 7 gallon tank is going to take less time to refill and heat than a larger tank. And, word amongst consumers is this hot water heater recovers quickly. 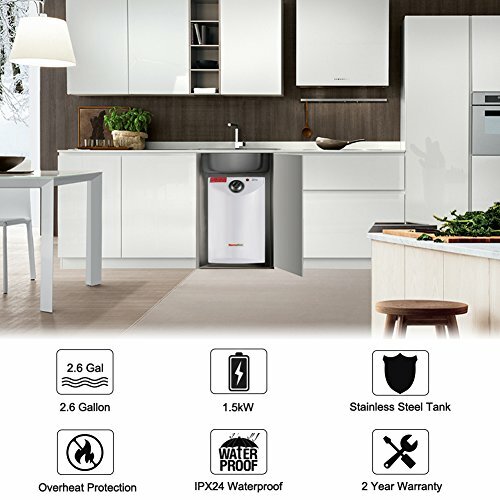 In addition, the Bosch Tronic 3000 T Electric Mini-Tank Water Heater offers 98% thermal efficiency. Therefore, thermal efficiency will help to keep the water hot once heated. And, in the long run, this means you will be saving on your bills each month. This under sink water heater has the ability to be installed vertically or horizontally. And, if you install it vertically, you will get the full 7 gallons of water. However, if you choose to install it horizontally, you will receive 5.1 gallons of water. Furthermore, this hot water heater can be mounted on a shelf or mounted to the wall or the floor. The Bosch Tronic 3000 T Electric Mini-Tank Water Heater has a heating capacity of 1440 Watts. And, this under sink water heater will heat between 65 degrees to 145 degrees Fahrenheit. In addition, it has an operating pressure of 150 psi. Therefore, this water heater can handle an extraordinary amount of pressure. Lastly, this 7 gallon under sink water heater measures 17.5 inches long, 14.5 inches wide and 17.5 inches tall. And, it comes in your choice of water tank sizes. Choose between a 2.5 Gallon, a 4 Gallon and a 7 Gallon. The Bosch Tronic 3000 T Electric Mini-Tank Water Heater is efficient and well insulated. Therefore, because it is well insulated, it is a money-saving machine. Furthermore, it is extremely easy to install. Lastly, this under sink water heater refills and heats up very quickly. Some consumers state the temperature fluctuates quite frequently, from one end of the spectrum to the other. In addition, some consumers have had leaking issues near the valve. However, it is important to note that the large majority of consumers are very happy with their purchase. The Thermoflow UT10 Mini-Tank Water Heater has a maximum capacity of 2.6 gallons. Therefore, if you were to use this water heater to shower with, you can expect approximately 6 to 7 minutes of hot water. And, this pick for best under sink water heater has a quick refill and heating time. So, once the hot water runs out, you won’t be held hostage for long. The Thermoflow UT10 Electric Mini-Tank Water Heater is constructed of stainless steel. And, stainless steel is a great material as it is ultra durable and corrosion resistant. This under sink water heater offers an energy-saving mode and a frost protection mode. With the frost protection mode, you can use this water heater throughout the year. The Thermoflow UT10 Electric Mini-Tank Water Heater features a temperature range of 45 degrees to 167 degrees Fahrenheit. And, this water heater has a Thermostop function. This function will kick in when the water heater reaches its set temperature. Therefore, if you set the temperature to 80 degrees Fahrenheit, this water heater will stop heating once heated. Lastly, this under sink hot water heater measures 18 inches long, 12.2 inches wide and 11 inches in diameter. And, this water heater has the ability to be wall or floor mounted. This water heater heats up in seconds. Furthermore, it has a super quick recovery time. Therefore, there is little suffering in between wait times. And, the Thermoflow UT10 Electric Mini-Tank Water Heater is easy to install. This unit does not come with a water heater hose. Therefore, in order to install, you will need to purchase this separately. And, this unit can be wall mounted. However, a wall mounting bracket is not included. Germany is known for great products and style. And, this under counter water heater reflects this renowned German engineering. 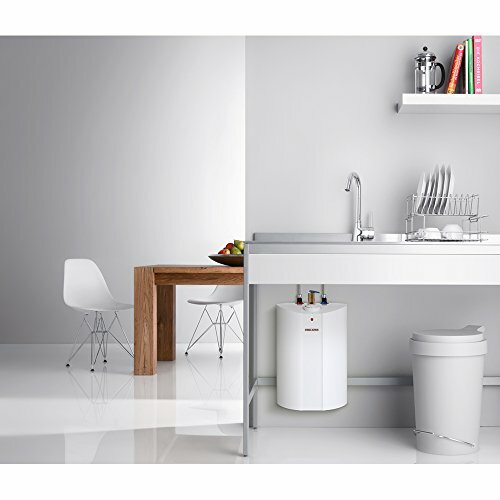 The Stiebel Eltron 233219 Mini-Tank Electric Water Heater is available in 3 different sizes. Choose between a 2.5 gallon, a 4 gallon or a 6 gallon. And, like we stated previously, the average shower expels approximately a gallon of water every 2 minutes. Therefore, be sure to choose the correct size for your situation so you are not left out in the cold. This under sink water heater features a glass-lined steel tank. This glass lining will increase insulation and, in turn, conserve energy. Furthermore, this under sink water heater comes encased in ABS plastic. ABS plastic is a great material as it is extremely durable and corrosion resistant. The Stiebel Eltron 233219 Mini-Tank Electric Water Heater works simply by plugging it into a 120 volt outlet. And, if you are wondering about installation, that is as difficult as it gets. Furthermore, you will most likely spend more time mounting this water heater than anything. And, speaking of mounting, this under sink water heater comes with a bracket. In addition, the water heater has a flat back, so when it is mounted, it is space-saving. The Stiebel Eltron 233219 Mini-Tank Electric Water Heater offers an adjustable temperature of 86 to 140 degrees Fahrenheit. Furthermore, the recovery time is approximately 18 minutes. Lastly, this 2.5 gallon under sink water heater measures 10.625 inches long, 11 inches wide and 18.688 inches tall. This under sink water heater has such great style, it would actually add to the bathroom if you mounted it on the wall. In addition, this water heater is made with high quality, durable materials. Lastly, it has a quick recovery time. Therefore, no need to wait too long for the water to refill and heat. Although this under sink hot water heater claims that it is easy to install, they failed to mention the safety valve which needs to be installed. Furthermore, the flat back has a cord attached. Therefore, this hinders the mounting process. This pick for best under sink water heater offers a 6 gallon tank. Therefore, this can accommodate approximately 12 minutes of hot water in the shower. And, once you run out of hot water, this tank will take approximately 30 minutes to refill and heat back up. 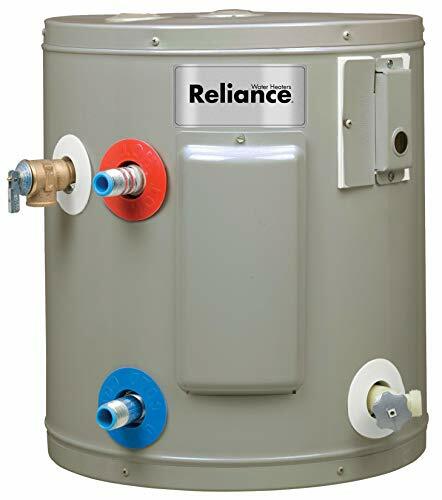 The Reliance 6 6 SOMS K Compact Electric Water Heater features a steel, glass-lined tank for added insulation. Furthermore, this tank comes with an anode rod. And, according to the Family Handyman, an anode rod is the second line of defense for corrosion. This line of defense attracts corrosive elements in the water, prolonging the life of the tank. And, this rod should be replaced once every 5 years. This under sink water heater offers side mounted cold and hot water outlets. However, you do have the option of connecting through the top. Lastly, the Reliance 6 6 SOMS K Compact Electric Water Heater measures 15.25 inches tall and 14.1 inches in diameter. This under sink hot water heater is quality constructed and extremely durable. In addition, the Reliance Compact Electric Water Heater offers multiple outlets for hook up. Therefore, you have a lot of options in the most awkward of spaces. Lastly, the fill and reheat time of this under sink water heater is rather quick. This water heater has a magnesium zinc anode. So, if you have a water softener, these two elements tend to clash. And, you will end up with a foul smell. The work around this is replacing the anode with an aluminum one. However, replacing the anode is not the easiest of tasks. Some of our other picks are beautiful enough to display. However, with this water heater, we recommend keeping it hidden. Our last pick for best under sink water heater is not necessarily an under sink water heater. However, it is a point-of-use tank. And, at 12 gallons, it is much larger than the other tanks on our list. But, it is still relatively compact. 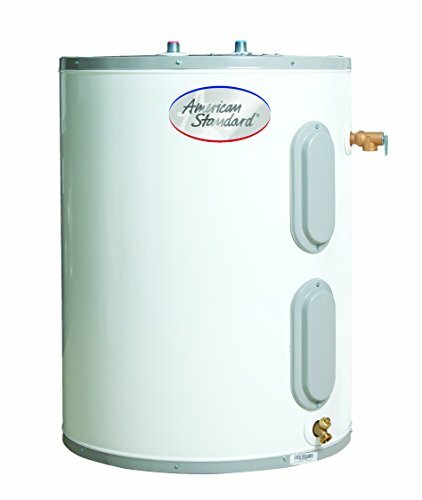 The American Standard CE-12-AS Point of Use Electric Water Heater is constructed of heavy gauge steel. And, steel is the perfect material as it is ultra durable and corrosion resistant. Of course, it doesn’t hurt that it is a thick steel, either. Furthermore, this steel is lined with glass. Therefore, this glass allows for added insulation. This water heater also features a brass drain valve. This valve will help to reduce sediment deposits. Furthermore, some tanks don’t have a drain valve and this is an extraordinarily handy feature. The American Standard Point of Use Electric Water Heater offers 150 psi and is tested at 300 psi. And, psi is an acronym for operating pressure. Furthermore, most tanks have a standard 150 psi. Therefore, if this tank can handle 300 psi, it can handle a whole lot of pressure. Finally, this tank measures 23 inches tall and 16 inches in diameter. Twelve gallons sounds great right? And the good news is, this tank is not that big in size. Therefore, you may be able to fit this under the sink and have extra, extra hot water. Furthermore, this water heater is very well constructed and built to last. We know, we know, a 12 gallon tank sounds great, right? However, not all of us have the room for it. In addition, quite a few consumers claim that the water heater arrived all beat up and bent out of shape, with one consumer stating it looked like they used the heater as a soccer ball. Needless to say, packaging and shipping could use some work.